Each $24 box contains 48 packs. Each pack contains 11 cards. The battle with P'an Ku is at an end, and the enemy of the Empire stands defeated once more. In the aftermath of the struggle, those complicit with the dark forces must be punished, and those loyal to the Empress are rewarded for their valor. 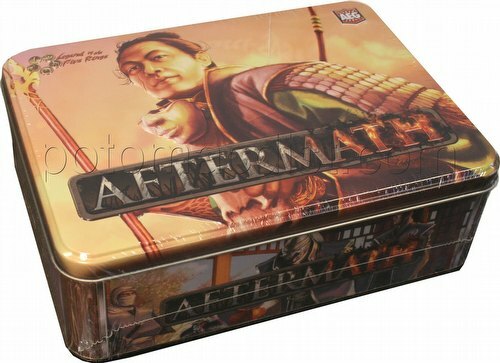 Aftermath is part of both the Emperor and Ivory arcs. Each booster tin includes embossed artwork. There are 150 Emperor/Ivory legal cards in the set, with a chance to get a foil version of a rare card in every pack.